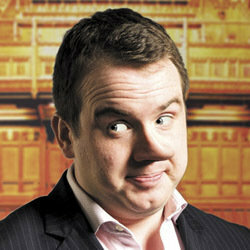 Given the pun in the title of his show, before I heard a word of Matt Forde’s hour, I knew two things. One it would be a politically based performance and it may well divide the room, hence the division bell pun. And I was right. On both accounts. Forde is a self-confessed Labour man through and through, as well as being a Talk Sport presenter and Tweeter and opens with the fact that he gets loads of abuse. I suppose with some of his somewhat unconventional leanings it is not surprising that he would annoy some people; in fact one guy had a go during his show!! He is entertaining, unafraid to voice his opinion on UK politics, taking a pop at some and surprisingly supporting others, Scottish Independence debate gets a mention as do a visit and meeting with our current PM. I think one would have to be fairly au fait with the political scene to get the best out of this hour, some where less informed perhaps and their enjoyment was less than others, but overall it is a well rounded performance.